No one recruited Dylann Roof. His foray into violent white nationalism arose from a single internet search engine query. "The event that truly awakened me was the Trayvon Martin case," Roof explained in a journal, referring to the 2012 shooting of Martin, an unarmed black teenager, by a vigilante. These words were read aloud to Roof last month, during his trial on 33 federal crimes, in a South Carolina courtroom accented with dark wood paneling. The voice delivering Roof's innermost thoughts back to him was Brittany Burke, the crime scene investigator who had documented his carnage. On June 17, 2015, Roof walked into Emanuel African Methodist Episcopal Church in Charleston, South Carolina. He sat down and listened to a Bible study, then pulled out a handgun and killed nine attendees. The spark that ignited his violent fury came to him in a web search after he learned of Martin and the man who shot him, George Zimmerman. "I was unable to understand what the big deal was," Burke quoted Roof in court, her voice nearly monotone as she read from the journal. "This prompted me to type the words 'black on white crime' into Google, and I was never the same since." Neither would Roof's country be the same after he carried out the plan inspired by that Google search. The killings prompted a national debate about racism and violence. In part as a reaction to the shooting, the Confederate battle flag atop the South Carolina statehouse — after years of slow-moving debate — would finally be permanently lowered. All because Roof had put the thoughts recorded in his handwritten journal into action. The small, brown leather-bound notebook contained Roof's bill of particulars against African-Americans — among them misleading and cherry-picked statistics he'd found online about an out-of-control epidemic of whites murdered and raped by blacks — and what he conceived of as the best response: violence and state-sanctioned subjugation of blacks. "I can say with confidence," Roof wrote in his journal, "that I am completely racially aware." Roof, whose federal case ended last month with his conviction, and whose sentencing began last week, wanted to cement his legacy as an alt-right activist's alt-right activist. It would be comforting to have an answer, to know that excessive national attention around a single case of racial vigilantism in Florida, a case that helped give rise to the Black Lives Matter movement, pushed him into the tentacles of white supremacist ideology on the web, where he self-radicalized. And yet that explanation opts for simplicity amid a reality that is much more complex. The seeds of Roof's radicalization sprouted from a variety of factors, among them a personal crisis that is common among many who share his racist views — most of whom, it goes without saying, don't act out in violent rampages. Roof's belongings, writings and remarks to the FBI don't provide the full picture of his journey into radicalization and, eventually, violence. But they provide some clues about a white nationalist movement that is growing increasingly mainstream. Those details can, in turn, aid in the fight against Roof's stated purpose: to exact violent retribution against black people for perceived injustices against whites. 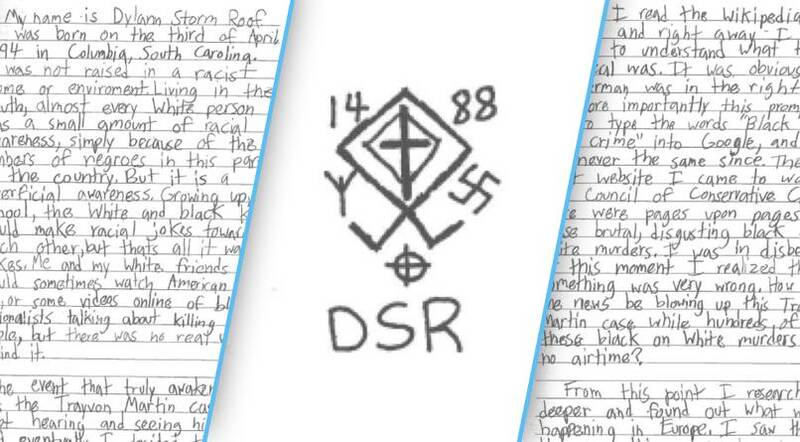 Anti-racism activists are mining Roof's story as they strategize to reach those like him before they come to the extreme conclusions he did, trying to ensure violence on this scale ends with him. Roof's life, far from sparking a race war, is serving as a sort of guide on how to build a racist — and, through reverse engineering, stop just that from happening to others.